Whether your goal is to improve your overall health, reach and maintain a healthy weight, learn the proper way to workout, train for a fitness competition, or just looking for accountably, then private one-on-one training is the place to start. You will be taken through progressive phases each week to help reach your fitness goals. No workout is the same, but every training session will challenge you and push you to bring out your inner athlete. Ask questions in a personal setting, while getting personal attention and guidance every step of the way. A small group personal training class can be a great way to break into the world of working with a personal trainer, and it won’t break the bank. Once you reap the benefits, you may decide that working with a personal trainer is a perfect way for you to get fit properly and stay motivated. Begin together, work together, and finish together with like-minded individuals is a great way to take your fitness and competitive level up a notch. If your fitness goal is weight loss, reducing body fat, or just overall health, this class is FOR YOU. Train, shape and strengthen with Anabells’ cutting-edge conditioning class. From resistance training to high-intensity intervals. These carefully designed workouts will build endurance and target every major muscle group while defining your body, all at the same time. 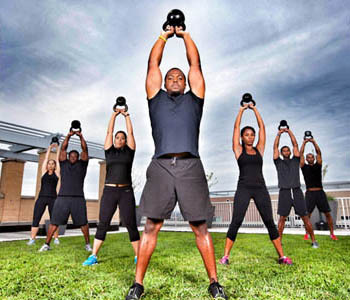 Anabells’ conditioning programs combine innovative tools, such as TRX suspension training, battling ropes and kettlebells, with time-honored training techniques to achieve maximum results. A customized tailored program designed for you to meet ANY fitness goal you may have. Weight loss, hypertrophy, bikini/physique ready etc. This includes: A phone consultation, photo evaluation to assess progress, personalized meal plan, strength training program, cardio program, supplement recommendation, weekly updates to program if needed, weekly tracking and feedback, support during length of the program. To learn more about you, you will need to fill out a medical and physical questionnaire, and a waiver release form.